I can still remember, I was around 7 or 8 years old sitting in our kitchen, waiting for my dad and older brother, Steve to get home from shotgun season in Southern IL. Back then, we didn’t have cell phones, so they couldn’t send a text message to instantly tell me they had killed a deer- I had to wait and the anticipation was killing me! I was excited to hear their stories and to look in the back of dad’s truck. Would he have shot a doe? Would he have a nice buck with 12 pts that would go on the wall? I lived for that time of year back then, and still do today. I don’t know if it was the same in your family, but there was a rite of passage to be able to go hunting with dad. My brother got to go that year and I knew it was only a matter of time before my turn would come. My dad and his 2 brothers all had some really nice bucks on the wall. At the age of 8, all I wanted was to be like them. I remember telling them how when I get older, I want have a wall full of nice bucks. I would read old North American Whitetail Magazines, everyone one I could get my hands on. I would come home from school and I would run out the backdoor on our 9 acres of woods in Monroe County and I’d use my old Bear Compound Bow. I had 3 different length aluminum orange arrows with 150 grain 2 blade broadheads. They were so dull, they probably couldn’t cut through mud! I would stalk around those woods for hours, praying I would see a deer or any animal! I loved those woods it was a magical place to 8 year old me. Little did I know back then that I would not only own my own land one day, but I would help others buy their piece of heaven, and even create some of my closest friendships in doing so. It’s been over 12 years since I started selling land in Southern and Central IL., and I have loved every second of it. I don’t sell to just make money, I do it because I love what I do. I feel blessed every day that I get to help someone sell their property, but most of all, I get to help someone that will love that new property just as much as the seller has. I remember helping a couple find a farm, this was 7-8 years ago and they had some young boys. They wanted a place that could be fixed-up and that they could all go hunting together on every year and get away from the city for a while. After talking, I told them that I had this nice 80 acres, with an amish built home on it. It would be perfect for a cabin, and it had some open land that they could farm or put in food plots. It also had some nice timber scattered around the property for different stand sites. I still remember walking around the farm with them. We walked all through the property, checking out the timber and creek, hills, and grassy fields. I pointed out that those fields would be the perfect place for a food plot, giving suggestions on planting corn, and then mowing the inside of the corn after it was up and in August or September to plant rye and oats and turnips, but leaving a strip of corn to split the greens. That way the bucks can’t look across it. They looked at me like I was crazy, but I could tell they were very excited. That family bought that farm almost a decade ago, and they still say thank you every now and then. That means the world to me. One of the young boys is now older and in college. He killed a really nice buck off that farm last year, and hearing that brings me back to why I sell land. 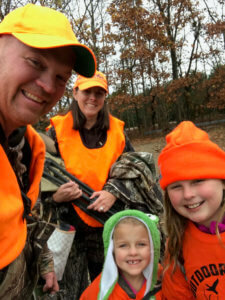 This year, I took my wife, my 9 year old daughter Grace, and my 4 year old daughter Hope hunting. Our blind overlooked one of my food plots that my dad and I planted a few months earlier. Let me tell you it was chaos in our blind with the whole family in there! I didn’t think we were going to see anything, but as things got settled, I finally spotted a small buck walking along the creek on the edge of the field. I pointed it out to my girls and the 4 year old kept saying, “Daddy, I see him” while she was looking the wrong way, but it didn’t matter because we were having a blast! Later, as the sun started to set, we saw a doe step out and with a really nice buck. He chased that doe all over the food plot and right by our blind! I knew the buck well from my trail camera pictures and he was a buck I was going to pass. 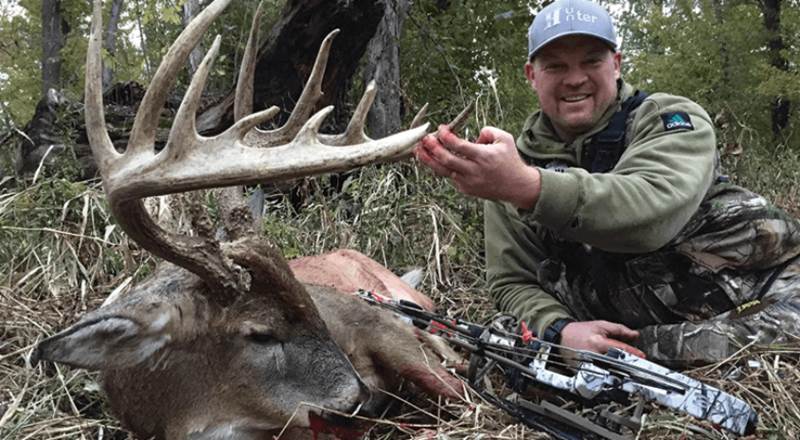 He was a 4 year old 160” 10 pt with some stickers around his bases. If I wasn’t bucked out, I would have probably shot him just so the girls could have experienced that moment. That day, they got to see a great buck and they also got to see 53 turkeys walk through the food plot, strutting, fighting and carrying on. It was one of the highlights of my hunting career, I wouldn’t trade the chaos for anything! If you’re looking to sell or buy LAND in Illinois, give me a call! Even if you just have a question about land, I would love to talk! (618) 830-BUCK.